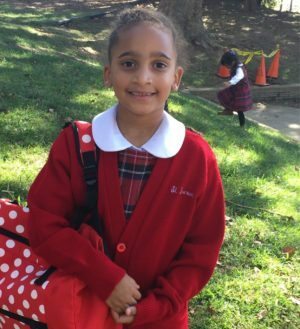 Meet Mia, a kindergartner at St. Laurence School, who dreams of being a scientist and loves math. Her mother, Barbara, loves the diverse atmosphere Mia’s private school offers her. A: Arts and crafts and science experiments. A: Math because I like to subtract. A: An 8th grader named Stephanie. She’s so nice! A: I hope that she always has the tools that she needs to succeed. A: I love the fact that her school is so diverse. We come from a diverse family so she feels comfortable at school and she appreciates everyone’s differences. A: It is important for us that our child attends a tuition-based school because she has the opportunity obtain a great education along with a religious education. We have noticed that the teachers are much more compassionate, helpful and available. It feels like we are part of a tight-knit community that is very welcoming and supportive of our child’s education. A: I was ecstatic! Since a lot of families apply and not all can be chosen, I felt like I won a million dollars. A: The scholarship we received allowed us to be able to send our daughter to a great school outside of our neighborhood. Without it, we would be very disappointed in the quality of education she would have received at our local school. A: I would tell them to definitely apply for a scholarship through the Children’s Scholarship Fund. Applying for my child was a life changing decision that I will always be thankful for.